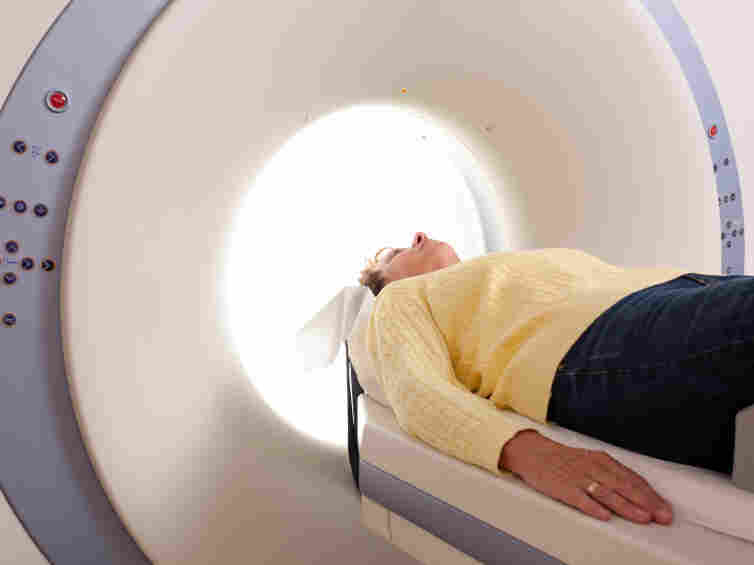 MRIs More Likely To Be Negative When The Doctor Profits : Shots - Health News Maybe you didn't need that MRI, but your doctor did. Scans are more likely to find no problems if doctors make money from the MRI, a study concludes. Congress and the states have tried to crack down on doctors self-referring to scanners they own, but the practice continues to drive up health care costs. Do you really need that MRI, or is your doctor just trying to make a buck? If your doctor says you need an MRI, your health may not be the only thing on his mind. Doctors who have a financial interest in the imaging equipment are more likely to send patients for scans when they don't have anything wrong with them. That's the conclusion of a researcher who combed through hundreds of patient records to examine MRI referral patterns. "There's definitely a bias," says Ben Paxton, a resident in radiology at Duke University Medical Center, who presented his results at the Radiological Society of North America meeting this week. Watchdogs have been warning about doctors sending patients for unnecessary scans for a long time. Way back in 1990, the Government Accountability Office found that Florida doctors ordered three times as many MRIs, twice as many CTs, and five times as many ultrasounds if they owned a piece of the imaging service. For just as long, Congress and state legislatures have been trying to rein in self-referrals, saying they encourage doctors to order unnecessary tests and drive up health care costs. But loopholes remain. For instance, doctors can refer patients to an MRI in their office, but they can also refer them to a scanner they own as long as it's in the same building. That's made MRI time-share appealing, with doctors sending patients to the MRI during the hours they own. According to the GAO, Medicare spending on imaging services performed in-house rose from 58 percent to 64 percent between 2000 and 2006. And money from imaging made up an increasing share of doctors' income. Paxton looked at 500 patient records to see not just the number of self-referrals, but also whether the MRIs found anything wrong. Patients whose doctors had skin in the game were much more likely to have a negative MRI of the lower back, showing no abnormalities. With the self-referring doctors, 42 percent of patients had negative scans, compared to 23 percent with doctors who didn't profit. The self-referring doctors were also more likely to send younger patients to the scanner. The average age of their patients was 49.6, compared to 56.9 for the doctors with no financial incentive. Patients should be aware that financial incentives can affect a doctor's prescribing, Paxton told Shots. "But I don't think it's a problem that should be addressed at the doctor-patient level. I don't think you should be second-guessing your doctor." What's needed, he says, are tougher state and federal laws requiring complete disclosure of physician ownership of labs, radiology clinics and other services, so that patients can take their business elsewhere if they choose.